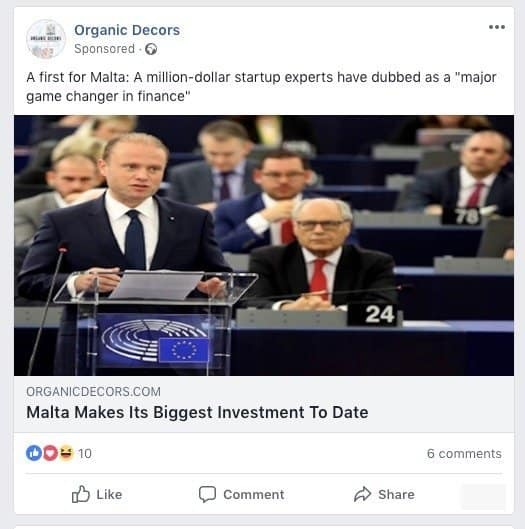 Facebook newsfeeds of Maltese users have seen sponsored adverts from a fake-news website called organicdecors.com carrying an image of prime minister Joseph Muscat and appearing to announce “Malta’s biggest investment to date”. Clicking on the link from the newsfeed takes the reader to a page with the URL www.organicdecors.com. However, the page is made to look for the untrained eye to be a CNN publication. 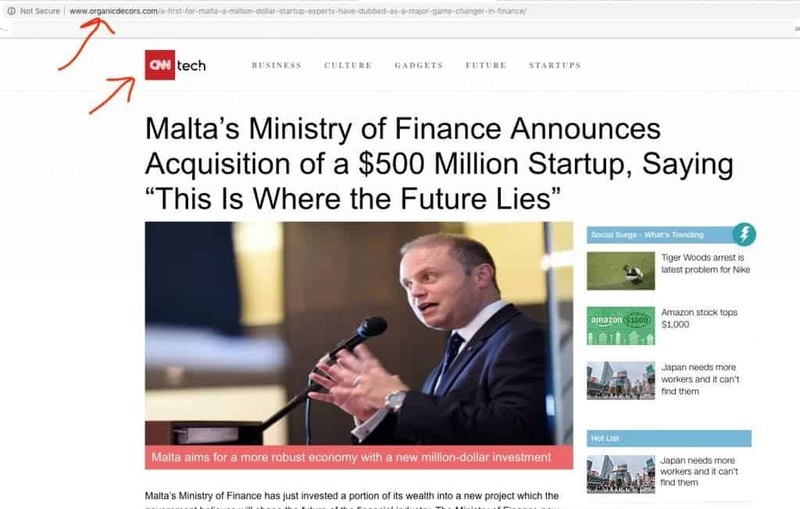 Another image of Joseph Muscat leads a story headlined “Malta’s Ministry of Finance Announces Acquisition of a $500 Million Startup”. Needless to say, the report is complete fiction as pro-Joseph Muscat propaganda. This is classic fake news that Facebook is committed to combat after pressure from several governments concerned with electoral manipulation by extremist organisations spreading falsehoods over social media. This technique is often used by organisations hiding behind anonymity to spread rumours or outright lies about political adversaries or to promote extremist political views. Facebook relies on users reporting fake news stories appearing on its platform and employs thousands of people to review posts that may contain hate speech, fake news or extremist propaganda. As far as has been publicly announced so far Facebook has made no such provision for posts in the Maltese language. In the meantime, someone in Malta is clearly spending money to test fake news methodologies. Sponsored posts on Facebook must be linked to a credit card account. It should, therefore, be reasonably easy for the police to determine who has sponsored these fake news. This website is informed Facebook has received ‘fake news alert’ complaints about these posts and should, therefore, have the appropriate records in case it receives inquiries about this from the police. In the present phase of the political season, this incident may appear harmless. However, the use of fake news on social media could have a severe impact on the normal course of political campaigning and elections, never a calm affair in Malta even without this complication.